People who are overweight subconsciously feel that they are too light. They lack grounding and try to make themselves heavier with physical food. 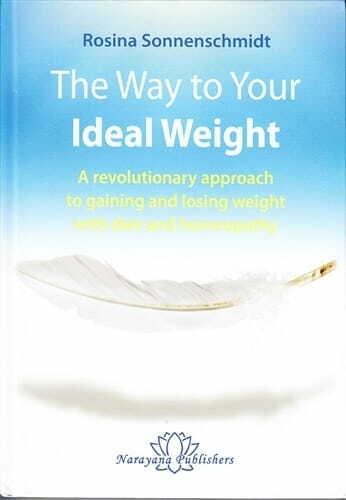 Underweight people feel that they are too heavy, and make themselves lighter by going without food. This astonishingly simple explanation has been confirmed time and time again in the practice of popular author Rosina Sonnenschmidt. Rosina Sonnenschmidt knows how to inspire her readers to take a more positive view of themselves, and addresses the tendency to eat too much or too little in a holistic treatment concept. This concept is built around basic therapies such as colon cleansing, deacidification, rhythmic breathing exercises and skincare. This sets the stage for the main therapy with diet and homeopathy. The curative diet, given a feeling of rhythm by the â€œgo-as-you-please dayâ€ (therapy-free day) focuses on tried-and-tested meals with steamed foods, raw juices, green thick juices and healing drinks. Although they have to be disciplined, patients can always be certain: â€œI can do it!â€ The homeopathic treatment focuses on bowel nosodes, miasmatic and constitutional remedies. Remedies such as Calcarea carbonica, Graphites, Iodum, Nuphar luteum, Saccharum album and Hyoscyamus are discussed in detail. Impressive case studies document the success of this concept. A ground-breaking work for patients and therapists alike. It makes a refreshing change from other literature on the subject, goes far beyond mere dietary recommendations and encourages readers to understand themselves and take enthusiastic responsibility for their own healing.